DBA's street series slotting improves pad bite and assists to reduce brake fade. 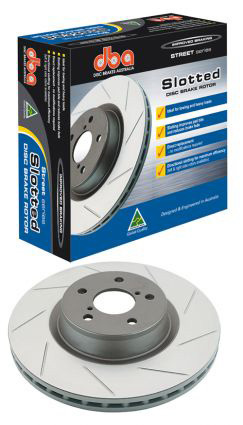 They are the perfect replacement rotor for the performance conscious street motorist. Patented 'Kangaroo Paw' ventilation design available on most popular DBA Street Series Rototor. Ideal for towing and heavy loads. Directional slotted design (Left-hand and right-hand disc rotors). Gun-metal grey paint provides better corrosion protection. Provides even pad wear and assists in minimising glazing of pad surfaces. Ideal for towing and heavy loads, where additional heat is usually generated. The slotting efficiently clears dust and debris, while creating better friction and a cleaner disc rotor.